Here I am, after hitting the inevitable midseason slump like USF of old (and thankfully not now - how bout 'em?) and this weekend I'm hitting the road... a bit. I'm taking my talents to Winston Salem to catch my first live college football game since Clemsom-Louisville in 2014, if you can believe it. This time it's UVA at Wake, for no other reason than it's live football nearby. Wake Forest is my closest Power Five school, at a distance less than half that of the next closest, a couple of shades of blue in Chapel Hill and Durham. If I were the sort to handpick allegiances (no), rock with private schools (hardly) or root for the contrarian choice (debatable), I might hop onto the Deac wagon, and barring that, season tickets sometimes seem tempting. Still, as many times as I've been in their venues, it has never been to root for the Demon Deacons. Rather, Wake has always been where I've gone to catch the other team, be it my own Bulls or Retrievers, my friends' Seminoles, or my part-time Terps. This weekend, I'll actually be clad in (their) black and gold, rooting for the home team with lukewarm enthusiasm. Oh, and seeing the band. There's always been a bit of a cruel intersection with two of my primary gameday passions. To be fully immersed in the tailgate lot often means missing some of the band's pregame traditions, and occasionally the pregame show itself. 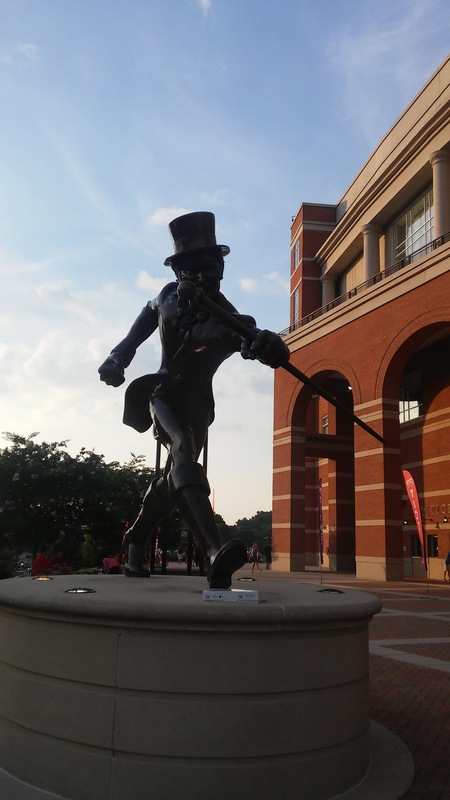 Tomorrow, I'm flying solo with no plans to tailgate intending instead to immerse myself in the Deacon Walk, pregame concert, and other traditions of the Spirit of the Old Gold and Black. I've been alternately critical and praiseworthy of SOTOGAB, due at least in part to my admitted big band bias, but I certainly enjoy them and I'm looking forward to spending some time with them. -A Pub sub. There's now a Public inm Winston-Salem and the one-time Floridian in me has not yet taken advantage. -Something brewed of the local variety: Winston's own Foothills or Small Batch,or perhaps something a bit further up the hill like Appalachian Mountain Brewing. -Wake Forest's school-initiated tailgate zone. Not always my scene, but I'm interested to see what they've got going on. -Deacon Walk, followed by SOTOGAB's pregame concert. In the tradition of slappoing -gating on the end of things, let's say I'm bandgating. That's the plan, and beyond that, it's shaping up to be a gorgeous fall day in the Triad. Can't wait!